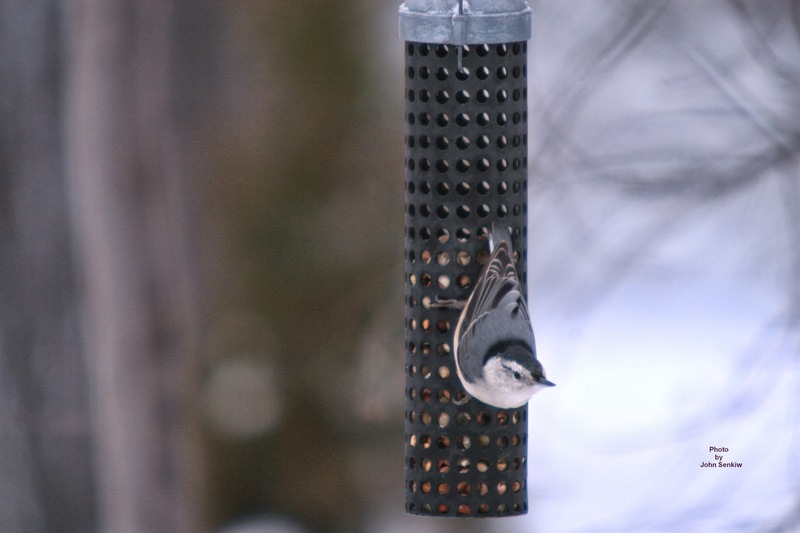 Our feeders are up and our winter birds are slowly showing up. Permanent residents like the Downy and Hairy Woodpeckers and Red Breasted Nuthatches are at our feeders almost daily. We still have two juncos that have not yet migrated south. They appear to like it here so perhaps they will stay over winter which they commonly do. Even a magpie came in and checked things out but did not appear to like what he saw and left. The only truly winter bird we have seen to date is the Northern Shrike. When the shrike flew into our yard all the small birds scattered and vanished. 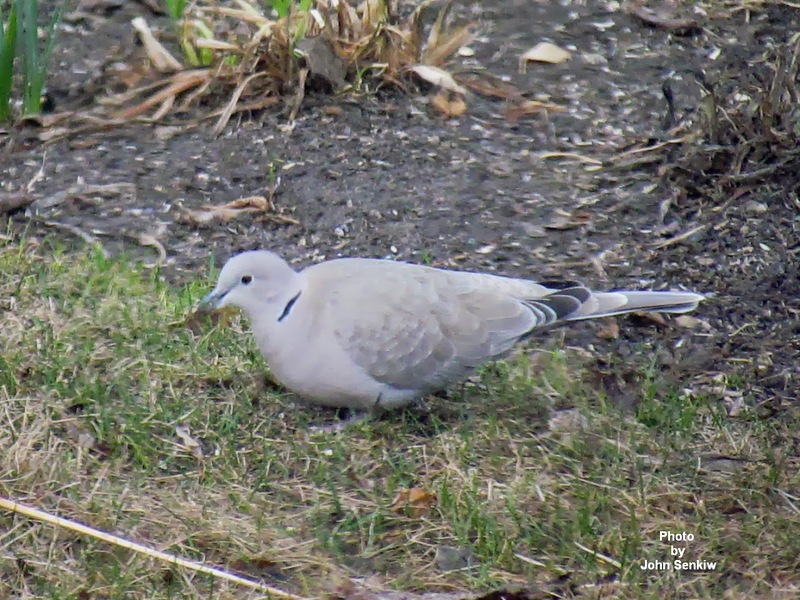 However, a lone Eurasian Collared Dove just kept feeding on the ground completely ignoring the shrike. The shrike was persistent and kept "buzzing" the dove but the dove appeared unconcerned. Eventually, the dove seemed to get tired of the harassment and flew off into the ash tree quickly followed by the shrike in hot pursuit. The dove put up with a little more harassment then flew off out of my sight, again with the shrike in hot pursuit. Since this incident a pair of Eurasian Collared Doves has been in our yard daily so it appears that not much damage was caused by the shrike. Other than the Northern Shrike no other winter birds like the Pine Grosbeaks nor Redpolls have arrived. So. there is still something to look forward to. This week's picture is a bit of a repeat with a pair of Eurasian Collared Doves resting on our arbour. (In fact, they have just flown past my window and landed on the power line in the back lane.) They were actually sleeping on the arbour but by the time I got my camera set up the female woke up and started preening. A short time later the male did the same. I decided to show the doves again because they looked so cute and because the picture provided proof that the shrike did not have dove for dinner. Here it is, Nov. 4th, and there is no snow on the ground, yet. It is trying though. At this time of the year every day without snow is a blessing. Remembrance Day is early enough for winter to set in. On the birding front things are slow but for one Hairy Woodpecker and one White Breasted Nuthatch in our backyard. 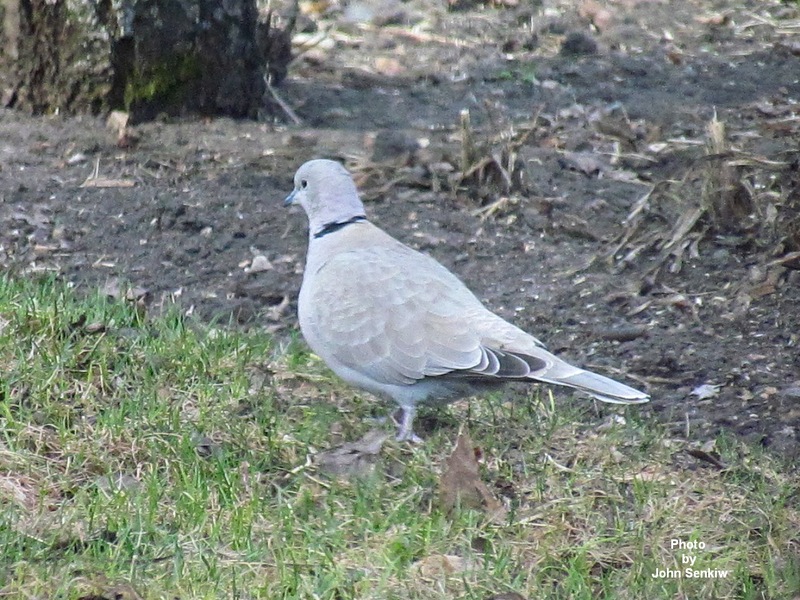 The pair of Eurasian Collared Doves still comes into our yard several times a day. I would like to have them hang around for the winter but I am not quite sure what to feed them. I am going to try cracked wheat. 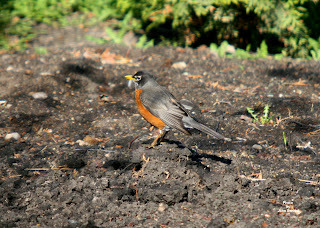 On the day before Halloween we had a Robin scratching around on the ground and feeding. It was nice to see something "summery" at this time of year. It was alone so it just might be one of those that decides to winter over. Time will tell. In the meantime it is back to watching House Sparrows and Chickadees. Driving to and from Foam Lake I have noticed more Rough Legged Hawks than usual. 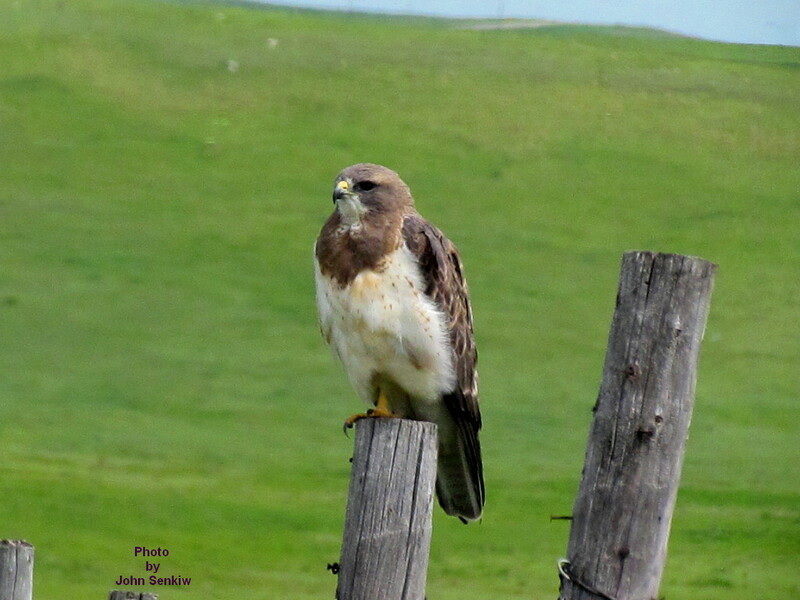 These Arctic hawks breed on the Tundra but winter over on the Great Plains mainly along the Missouri/Mississippi drainage system. They are quite common here late in the fall but are usually mistaken for the more common summer hawk, the Northern Harrier (Marsh Hawk). Both are slender gull-like hawks that behave and look much like each other with both species even having the large white rump. My next task is to set out my winter feeders especially the ones with suet since the weather is cold enough to prevent spoilage. Another feeder that I put out only in the winter is canola seed for the reason that the only birds that seem to like it are the Redpolls. The Redpolls are not here yet but we will be ready for them if and when they come. 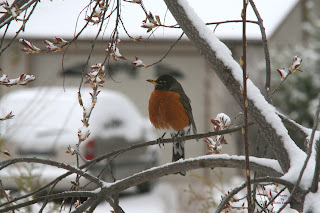 This week's pictures are of a Robin feeding in the same area where we saw the one mentioned in this article and a White Breasted Nuthatch at one of our peanut feeders. We are in that time of year that I refer to as the "doldrums of birding". The summer residents and most of the transients are gone south; the winter birds have not moved here yet; even permanent residents like woodpeckers and nuthatches have not left the rural areas and moved into towns which they will soon do. So for the time being, it is Chickadees, House Sparrows, the odd Junco, a pair of Eurasian Collared Doves and a very confused and very dead Ruffed Grouse. The Ruffed Grouse is our only woodland "wild chicken" as it were (see Art. No. 96). Once in a while in the fall they invade urban areas where they seem to pick up a bad case of "stupid" for lack of a better term. Here they become very tame to the point they have to be shooed away otherwise they just stand there and look at you with a blank look in their eyes. Years back when we lived in Wishart, one fall when there was snow on the ground, a Ruffed Grouse stood in our doorstep and would not let our girls into the house when they came home from school. I had to chase the grouse away. It moved to the backyard to our patio and spent the next three weeks or so sleeping right up against the glass patio door every night. During this same period one of our neighbours had a grouse fly right through her living room picture window. When the startled neighbour came to the living room to investigate there was the dying grouse in the middle of the floor amid all kinds of glass. Almost the same thing happened to me several weeks ago. I was working at the dining room table and looked up just in time to see a very large bird come barrelling straight at me. It hit the window with a tremendous wallop startling everybody in the house especially me. Fortunately, the window did not break but sadly the grouse was killed instantly. Theories abound as to why this happens but the most plausible is that when there is a very successful hatch the young have to disperse and there is really no place for them to go so they head for the towns. Being young and not very wise they end up in places unfamiliar to them causing harm to themselves and town residents alike. A much more pleasant event is the daily visitation of a pair of Eurasian Collared Doves (see Art. No. 50). They started coming to our yard to the bird baths for drinking water and have continued to do so even though the cold weather has frozen the water. It is nice to see them walking around in the yard looking for something to eat. The Eurasian Collared Dove is an invasive species from Europe that was successfully introduced into the West Indies from where it flew across to Florida and has spread throughout most of the continent. It is now here. It is quite similar to the native Mourning Dove but can be quite easily distinguished from it by the thin black collar on the back of the neck. 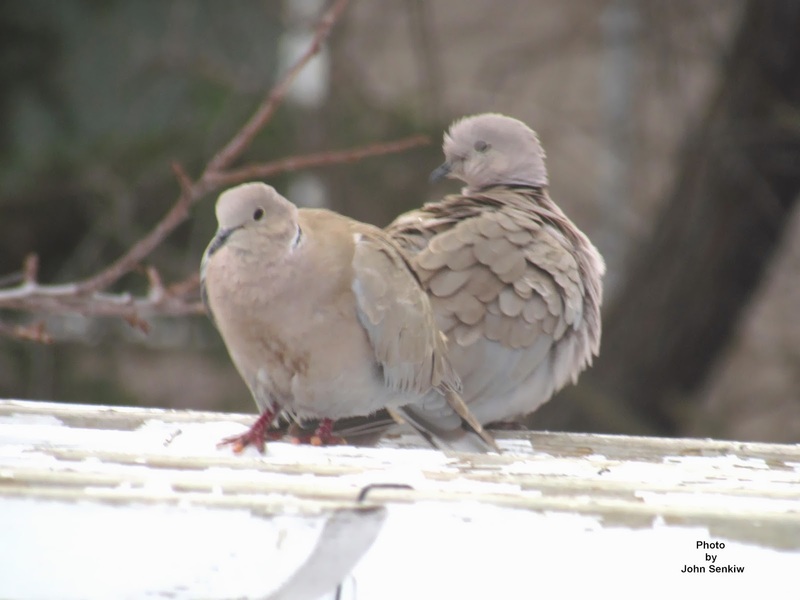 Unlike the Mourning Dove the Eurasian Collared Dove is not migratory and can be expected here all year round. There is some confusion as to where the Ringed Turtle Dove fits in to all this. Older bird books do list it as a distinct species but without much explanation. Here is the whole scoop as I understand it. There are only two species of Collared Doves: the Eurasian and African. They are closely related and very similar to one another with the African being slightly smaller and much paler. Furthermore, when vocalizing the African has a two note song while the Eurasian has a three note sound. The Ringed Turtle Dove is nothing more than the domestic version of the African Collared Dove and escaped or released birds have not succeeded in the wild. At present the name "Ringed Turtle Dove" has been discontinued by ornithologists and replaced by the original "African Collared Dove". 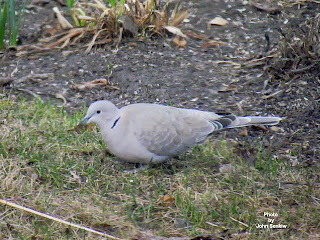 This week's pictures of the Eurasian Collared Dove were taken in our backyard this spring. The warm summerlike weather has cooled and to the chagrin of many the rains have come. We had a late spring and now it looks like we are getting a late fall. As of this writing we finally have had our first frosts but most of the leaves are still on the trees. Moreover, the skies around here seem to have a constant flow of waterfowl. Although most waterfowl breed locally Sandhill Cranes do not. They nest further north in bogs and marshes. 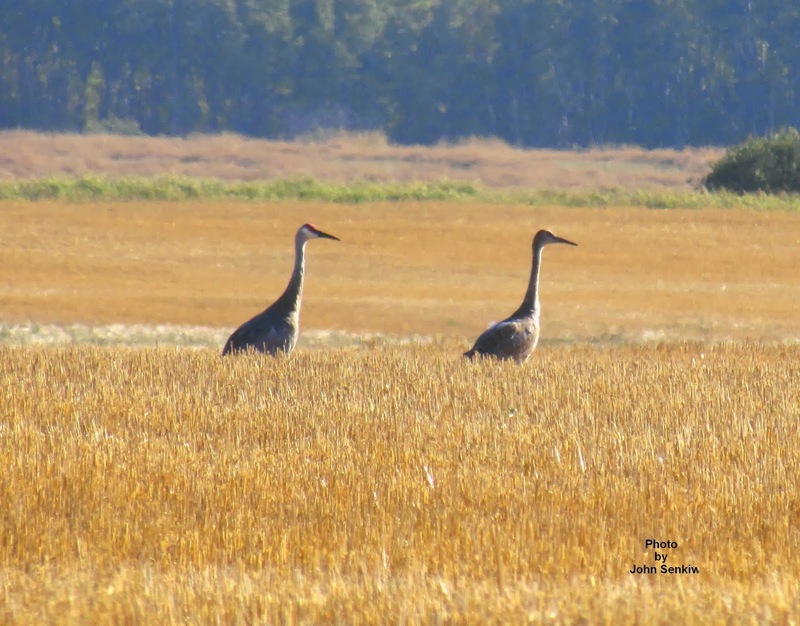 Prior to the arrival of Europeans Sandhill Cranes and Whooping Cranes apparently nested throughout the prairies. Perhaps they will do so again. At present they are common here only in the spring and fall during their migration to and from their wintering grounds in the southern US and central Mexico. Sand hill Cranes were somewhat scarce until the 1950s when their numbers started to expand. By the late 1960s a short hunting season (from September 1 to the second Saturday in September) was opened. Even with new hunting pressure the population has continued to grow and presently the hunting season is open from September 1 to December 31 annually. In addition, Sandhill Cranes are hunted during the winter in places like Arizona and New Mexico. There are all kinds of derogatory stories out there about the palatability of the Sandhill Crane. Having eaten a variety of species of goose, duck and grouse and even coots I found that the Sandhill Cranes are the most palatable of the bunch. However, perception is a powerful force and prejudices die hard. The Sandhill Crane is one of our tallest birds with a mature male standing over four feet high. Colour varies from a whitish-grey to a dark grey with juveniles being quite brown. Adults have white chin straps much like Canada Geese and naked red foreheads which has resulted in them being incorrectly called "wild turkeys" by some people. In flight the neck is stretched straight out like a goose or duck but much longer. When flying it flaps its wings with a quick smart distinctive upstroke which could be described as flipped or snapped upwards. There are two subspecies of Sandhill Cranes in Canada, the Lesser and Greater. The Lesser nests on the Tundra while the Greater nests in bogs and marshes south of the Boreal Forest. Except for size, the three foot Lesser and four foot Greater are very similar in all respects. Both are territorial when breeding but band together in large flocks for migration unlike their close relative the Whooping Crane that is territorial all year round. I took this week's photo several weeks ago just north of Foam Lake. On the way home while driving on highway 310 we had to stop for a doe refusing to move off the road. While waiting for her to move we noticed some movement in the ditch near the car and saw three fawns standing there looking at us. Cute. I tried to get a picture but they were skittish and bounded away into the bush on stiff legs the way only a Mule Deer does. I tried to get a picture of the doe but all I got was her behind as she disappeared into the bush after her young. 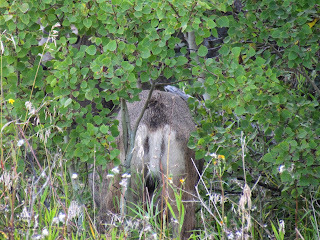 So, this week's photo also includes a Mule Deer's backside. Enjoy. Several days ago we got a call from a local birder who reported seeing a Great Egret along the Yellowhead Highway just north of Dafoe. Now my wife and I have seen many Great Egrets over the years that we have traveled the USA but have never seen one in Saskatchewan. One has a better chance of seeing a Whopping Crane here than a Great Egret even though the egret is common and the crane is endangered. Anyway we decided to check it out. Sure enough as we approached the Quill Lake overflow there were actually two Great Egrets in the ditch right along the road. Unfortunately, we were not able to get any pictures as the road was very busy and stopping along the shoulder would have been unwise. We did find an approach nearby but the egrets flew to the far side of the slough so we observed them for several minutes with binoculars and then went home. In Canada the Great Egret is common only in the extreme southern tip of Ontario elsewhere it is a straggler. In the USA and Mexico it is common in coastal and marshy areas. Identifying the Great Egret can be a bit of a problem especially in the southern USA. There are two other white egrets, the Snowy and Cattle, as well as a white race of the Great Blue Heron and the all white juveniles of the Little Blue Heron and Reddish Egret. One then has to look at other field marks such as the colour and size of the bill, colour of the legs and feet and size of the bird itself. In Saskatchewan things are a little easier as there are only two other white herons, the Cattle Egret and Snowy Egret and like the Great Egret both are rare. 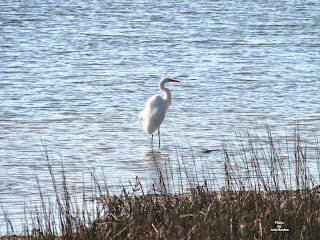 Standing over three feet high the Great Egret is the largest with a massive yellow bill and black legs and feet; the two foot high Snowy has a more delicate and slender all black bill and black legs with bright yellow feet; the Cattle Egret is the smallest of the three with a stubby pinkish bill and light coloured legs and feet. As with all herons the males and females are the same. The terms "egret and heron" have no scientific rationale and are used in much the same way that the terms "dove and pigeon" are used. Herons that had feathers suitable for the millinery industry were called egrets after the French word for feathers "aigrettes". The rest were simply called herons. Presently, with a few exceptions, the term "egrets" applies to the white herons and the rest are simply "herons". Over the years there has been confusion as to whether a long necked bird is a crane or heron because they look so much the same. The easiest way to tell them apart is when they are in flight. A heron/egret flies with its neck folded back so that the head is tucked into the shoulders while a crane flies with its neck stretched straight out. Another difference is that herons nest in trees (usually in colonies) while cranes nest in marshes on beds of marsh grasses and cattails. 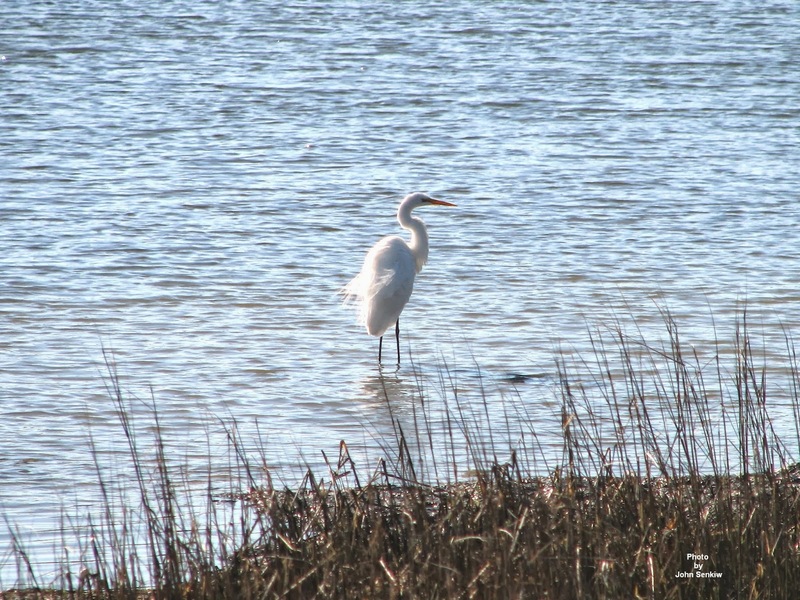 This week's photo of a Great Egret was taken several years ago at the San Elijo Lagoon just north of San Diego, CA. Fall migratory bird hunting season opened on September 1 and at daybreak and sunset gunfire is frequently heard. Although a number of different birds may be legally hunted, including Coots, Sandhill Cranes, Wilson's Snipe and about fifteen species of ducks, by far the most popular is the goose. There are only four species of geese that can be expected locally - Canada (now split into two species the Canada and Cackling), Snow and White Fronted. A fifth specie, the uncommon Ross's Goose, is found in mixed flocks of Snow Geese and is so similar to them that great care must b taken in identifying it. Like the Snow Goose the White Fronted is circumpolar in distribution. Historically, the White Fronted used to be the most prized game bird of hunters. Heavy hunting eventually forced governments to impose and then reduce bag limits for hunters in order to keep populations viable. However, an unexpected turn of events reversed the fortunes of the White Fronted Goose. The populations of both the Snow and Canada Geese literally exploded causing governments to raise the bag limits on both species beyond that of the White Fronted Goose. With hunting pressure diverted to the other very numerous species the White Fronted has had time to recover and maintain its numbers. The White Fronted is between the Snow and Canada Goose in size and is often referred to as medium sized. In flight the White Fronted makes a kind of musical laughing sound that, once heard, is quite recognizable. Oftentimes they will be found with other geese when feeding or roosting for the night but unlike the Ross's and Snow they do not mingle. A field might contain all three species but the Snows will be in one group, the Canadas in another part and the White Fronted off to one side feeding by themselves. In such circumstances the Snows and Canadas are easy to identify and what is left over is the White Fronted. 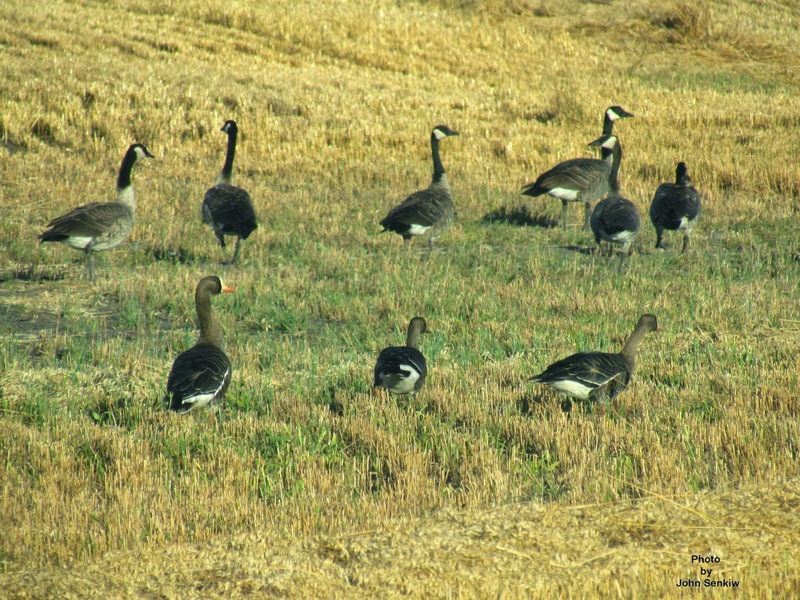 If observing a field of geese look for a small group of dark grey-brown geese with no obvious field marks. 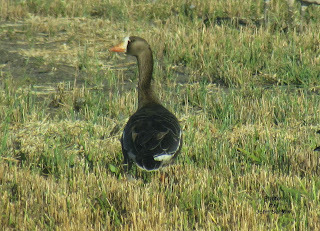 With binoculars the white patch above the bill, from where the goose gets its name, is clearly visible. 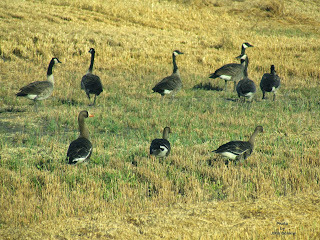 Another good field mark, if the goose is not in a stubble field, is the orange feet. It is our only wild goose to have orange feet. Snow Geese have pink feet and the Canadas have black feet. Like all geese males and females are the same. This week's pictures of the White Fronted Geese, sometimes called ”Speckled Bellies" by hunters, were taken along the Margo grid. The field was filled with all three (possibly five) species but the nearest to the road were the White Fronted. 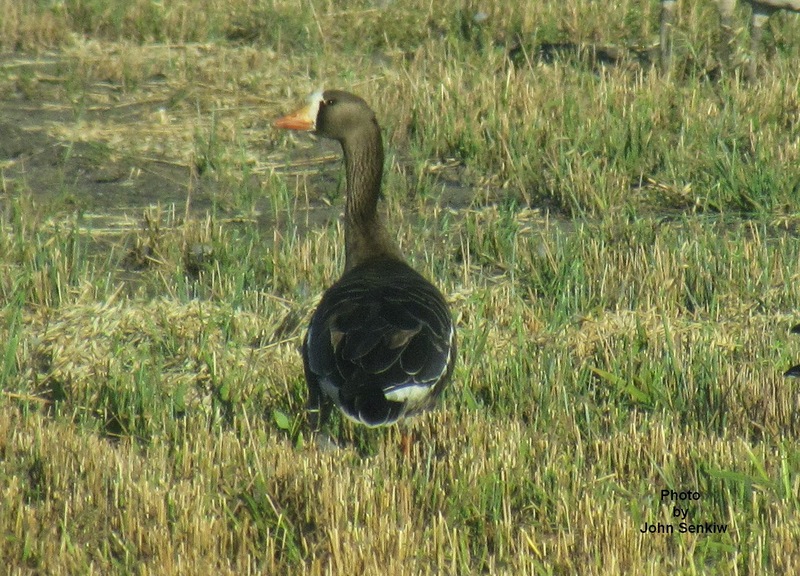 My wife was excited because seeing a White Fronted Goose was a lifer for her. The geese were a little wary of us and kept walking away while keeping a watchful eye out for us. I did manage to get some decent shots and the white nose patch is clearly visible but the feet are buried in stubble. Canada Geese are in the background. The swarms of warblers are considerably reduced but berry eating flickers have gone from one male to at least three. The Tree Swallows and Purple Martins have been long gone but the Barn Swallows still linger. An interesting note is that there were actually two Barn Swallows' nest on our neighbour's house and not one as previously reported. There was one on the north peak as well as the south. We also spotted Ruby Crowned Kinglets and Least Flycatchers in our yard. Both are local nesters but, like Downey and Hairy Woodpeckers, tend not to show up in our yards during breeding season. Unlike the woodpeckers they do migrate. While driving down rural roads I noticed an influx of cormorants around various deeper bodies of water especially dugouts. When stocked with fish dugouts were especially favoured by cormorants for the easy pickings. Even people in cities with larger yards that had outdoor goldfish ponds were paid visits by the cormorants. This did not endear them to the people directly affected. As a group cormorants have been reclassified at least three times and taxonomists still are unsure where to place them and so the debate continues. Eventually DNA testing will probably resolve the issue. Since ancient times until the seventeenth century it was believed they were related to the crow family and several European countries referred to cormorants as "sea ravens". In fact the name cormorant might be a contraction from the Latin "corvus marinus" which means sea raven. In any case a cormorant especially in flight looks remarkably like a crow except for the longish neck and faster wing beat. 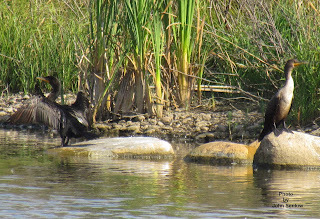 Except for the Double Crested all cormorants are coastal birds that feed strictly on fish that they catch by diving from the shallows to more than 45 metres deep. In the past peoples in parts of Asia and the Mediterranean tamed and trained cormorants to fish in much the same way falcons were utilized to catch birds and small mammals. A ring was put around the cormorant's neck restricting the size of the fish it could swallow. A small fish would be eaten but a large one would get stuck in the throat and the cormorant would have to get its master to help getting the fish out which the fisherman kept for himself. It was hoped that the cormorant would catch enough fish for the fisherman before it was full itself and lost interest in fishing. Fishing with cormorants is still practised in some parts of Asia today. The only cormorant to be found on fresh water is the Double Crested so named because of small tufts of feathers that appear on either side of the head during breeding season which are seldom visible even during breeding season. (Cormorants with long feathers on their heads are often called 'shags"). One characteristic of the cormorants shared with only one other bird, the Anhinga, is its habit of drying itself out after a swim. The bird climbs onto a rock or snag near or in the water, faces the sun, and spreads out its wings to expose a greater area and to dry out and warm up more quickly. This pose reminded early Christians of the cross so the bird was given special status and appeared on the coats of arms of several European countries. This week's picture is of two Double Crested Cormorants perched on rocks at an abandoned water filled gravel pit near Tuffnell. One of the birds is in typical cormorant pose sunning itself. With a mild fall predicted by Environment Canada harvest should be above average in all respects. No matter which road or highway one takes in rural Saskatchewan harvest machinery is in operation everywhere. May it continue. The trees and shrubs in our yard are "crawling" with migratory birds. This list includes all the birds mentioned in last week's article and the addition of Red Eyed Vireos, Black and White Warblers and White Throated Sparrows. White Throats are very common in the fall but they tend to stay away from towns and spend most of their time in tall grasses and shrubs along road sides and dried out sloughs. As a youngster I always wondered what birds were making those distinct insect-like chirps which were really noticeable in the evening after the sun set and the winds had died down. It was not until many years later when I started to do a lot of duck hunting in the late evenings did I finally learn what they were. Hunting usually involves a lot of waiting with intermittent and brief action and, I probably spent more time looking at various small birds feeding than I did for the ducks I was supposed to be shooting. Anyway, it was here that I actually observed the various sparrows feeding and communicating with each other that I made my discovery of the mystery birds. Both last week and this week I have mentioned vireos so, perhaps, a little more discussion is in order. 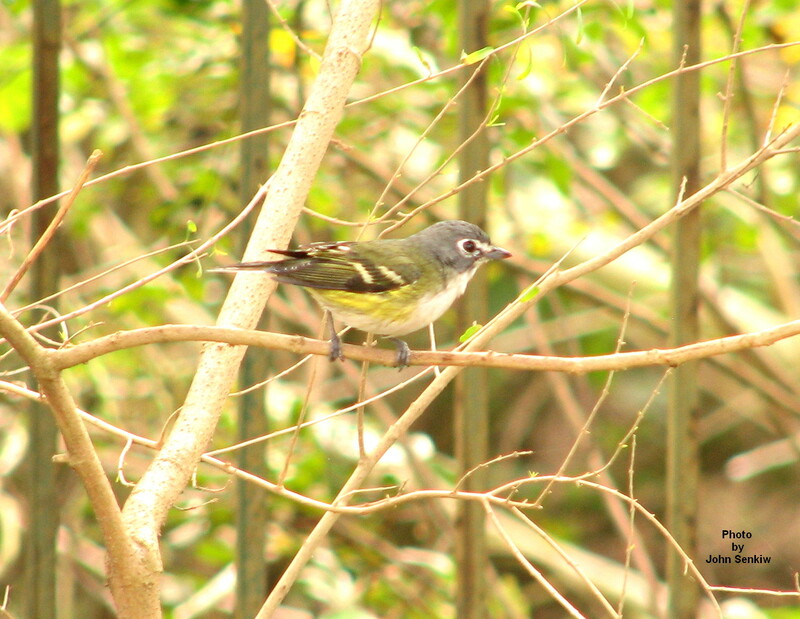 As a group vireos are drab greenish small birds that behave and look like fall warblers. Most of the field marks used to distinguish species are quite subtle and even their songs are remarkably similar save for the Warbling Vireo. Their songs are rather husky and of a robin-like quality except with more abrupt phrasing making them less musical. They are insect eaters but do like fruit which is probably why they are in the chokecherry bushes. Unlike warblers where spring males are usually dramatically different from the females vireo males and females are alike. Like the Wood Warblers they are strictly a new world group of birds unrelated to each other. The Wood Warblers are related to the sparrows while the vireos are related to, of all things, the crow family. Four species of vireos occur locally-the Red Eyed, Warbling, Blue Headed and Philadelphia. Of the four the first two listed also nest locally but usually in rural areas rather than towns and cities. The other two nest further north in and near the Boreal forest passing through here in the spring and fall. The Blue Headed Vireo has only recently been listed as a distinct species. Prior to this it was known as the Solitary Vireo and most bird books have it named as such. The Solitary Vireo is now three species-the Blue Headed, Cassins and Plumbeous. All three are very similar to one another and can be safely identified by range. However, the Cassins and Plumbeous do coexist on their wintering grounds in southern Arizona. In fact we saw both the Cassins and Plumbeous on one guided field trip there in 2008. Actually we had gone on this excursion to see Trogons which we never did see but seeing the two vireos was a fair trade. The Blue Headed is the only one of the three to be seen here and is relatively easy to identify by its pronounced eye ring leading to the beak making it look as if it is wearing spectacles. The name, Blue Headed, is a bit of a misnomer as the head is essentially a dark gray. This week's picture was taken several years ago on its wintering grounds in southern Texas. In Latin the word vireo is a phrase meaning, "I am green". That folks just about says it all. Although we are experiencing our longest lasting heat wave this year there are sure signs that fall is underway. Some trees are starting to shed their leaves and the goldenrod and fall asters are in full bloom. I always have mixed feelings at this time of year. Seeing crops being swathed brings back memories of the feelings of excitement at the thought of being rewarded for a hard summer's work. However, with a new school year just around the corner the excitement was somewhat muted. Not only did we have to attend school each and every day but upon getting home we had to unload the grain trucks and trailers that had been filled during the day. As there were no hydraulics this meant a lot of hard shoveling. Still, it was a fun time and the closest I come to it now is the picking of cherries and apples in our yard. Not quite the same thing. On the birding front geese are starting to flock and many of the fall warblers that have nested in the Boreal Forest are in town. As of this writing I have seen the Palm, Tennessee, Orange Crowned, Yellow Rumped (Myrtle), Wilson's and Blackpoll Warblers. Although the males are quite distinct and easy to identify in the spring they moult into very drab colours for the winter and look much like the females. Even the differences between species is not very significant. For those birders who like challenges identifying fall warblers will provide just that. Binoculars, bird books and sharp eyes are essential. We did have the pleasant surprise of seeing a Blue Headed Vireo in our chokecherries picking at gnats. The bird is not a rarity by any means but it is uncommon especially in town and can be seen only in the spring and fall. One day our feeder was visited by a mother House Finch with her four youngsters. Now House Finches are common but evidence of them nesting locally is a first for me. Our fall flowers have attracted juvenile Ruby Throated Hummingbirds that are preparing themselves for their winter migration to Central America. This year they seem to be more numerous than usual and frequently there are two or three birds at the flowers at any one time. Nice. This week's photo is of an unexpected event - at least for me. 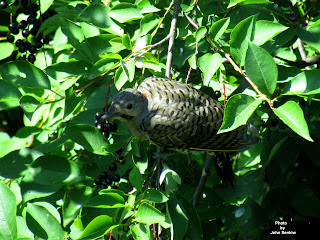 We have one male Flicker that actually eats chokecherries. I managed to get a good shot of him feasting on said chokecherries. 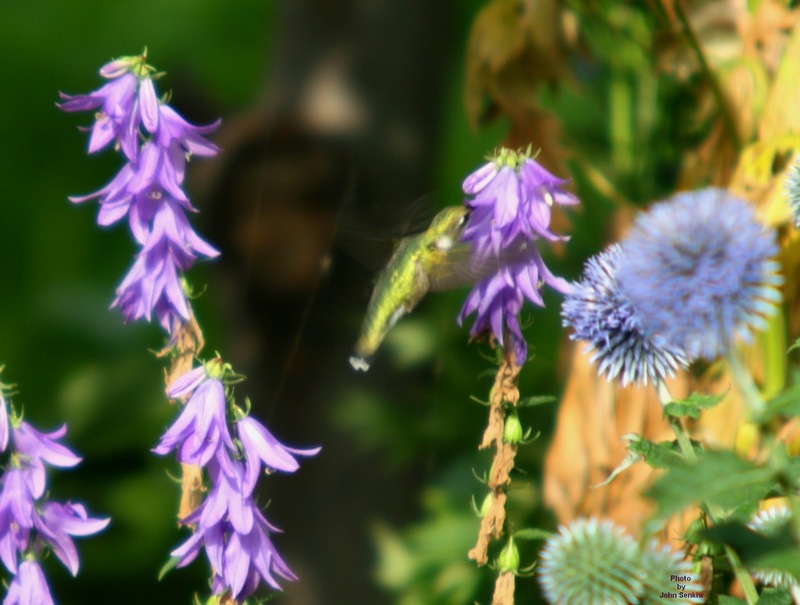 Our flower beds are in full bloom and with that an accompanying increase of flower loving wildlife like butterflies, bees and of course one of nature's wonders, the hummingbirds. 1). As a group they are the smallest birds in the world. The smallest is the Bee Hummingbird of Cuba; the largest is the robin-sized Giant Hummingbird of South America. 2). The wing structure is modified allowing for much greater rotation at the shoulder giving the hummer greater manoeuvrability in flight and the wrist joint is fused for greater stability at high rpm. 3). They have oversized breast muscles capable of driving the wings up to 80 flaps per second. These last two characteristics allow the hummer to fly backwards, sideways, straight up and down, hover and even fly upside down. No other bird can do this. By comparison a crow flaps its wings about 4 times a second; a House Sparrow about 10 and all have to be moving forward to stay aloft. 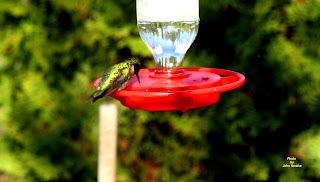 The rapid wing beat produces a humming sound from which the birds get their name of "hummingbirds". 4). Flying takes a lot of energy and the hummers need it in spades. In fact most "normal" bird foods would not provide sufficient energy quickly enough to keep a hummer going and the only naturally ready source of such energy is the sugar in the nectar of flowers. (Yes, flower nectar has the very same sugar that is found in your sugar bowl). They consume at least their body weight in sugar daily ("treats" would not be a health concern) and augment their diets with small insects for protein. This very high rate of energy consumption has another serious drawback - the hummer has to feed constantly to survive. However, like all birds and animals it, also, has to sleep which it does at night but to go that long without food the hummer could starve by morning. To avoid starving the hummer goes into a kind of overnight hibernation called "torpor" where the heartbeat drops from several hundred to about 30 resulting in very little energy demand. In the morning, with its energy load intact, the hummer takes a few minutes to "wake" up then carries on with its daily activities. 5). Without getting into too much scientific detail different colour is simply light with different frequencies (red being the lowest frequency and violet the highest). Using voice as an analogy: red would be base and violet would be soprano. Most of the colour that we see is caused by reflection. For example, a green tree absorbs all frequencies except green which it reflects and we sense it with our eyes as green (assuming no colour blindness). This reflective material is known as pigment. Like most birds hummers have pigment but they also have prismatic cells in some of their feathers especially the throat area (referred to as gorgets) that break up light (refract) into the various colours the same way that crystal chandeliers do. The effect is that the bird glows or looks iridescent. Thus the gorget of the male hummer usually looks all black because it does not carry any pigment and therefore does not reflect any light but, when he decides to "impress the ladies" he knows the exact angle to turn his head and body so as catch good sunlight and refract whatever colour he has been endowed with (usually red). The females seem to approve. There are 320 different species of hummingbirds in the world and all are in the Americas with about 15 or so showing up in the US (mostly in Arizona), 5 in Canada and 2 in Saskatchewan. The common one around here is the Ruby Throated with the odd stray Rufous. The male Rufous is almost all copper coloured and in good sunlight shines like a newly minted copper penny. It is very common in the Rocky Mountains In flight the wings make a high pitched metallic whine and several males at a feeder is quite spectacular. Male hummers are more brightly coloured than the females which do not have prismatic gorgets. Like egrets and swallows hummers were also hunted for their feathers for the fashion industry just over a century ago. Because of the prismatic nature of a hummer's feathers they were utilized more like jewellery. The more colourful the bird the greater the demand and the higher the price. Most birds raise their young as a couple with both parents actively involved in rearing them. One notable exception is the duck family where the hen has the sole responsibility to raise the young. Well, in that regard the female hummer is like a hen duck - she raises the young all by herself. The male joins other males in a kind of bachelor group and spends the summer further north. That is why males are seldom seen around town much beyond mid summer. This week's pictures were taken in our backyard a few years ago. The male is at the feeder; the female is at the Kent Bells. The male's gorget appears black but the back feathers are an iridescent green. This is the one big advantage of the digital camera - it captures the iridescence of the bird that a film camera never could. To really appreciate the iridescence log on to my website www.johnthebirder.com. After leaving home for good in the mid 1960s to start my career in education I really missed the birds and birdsong that were ever present on the farm. In particular I missed the Barn Swallows. As in most farmsteads in our area there were many older buildings made of logs of which one was usually a barn. In the summer doors were left open to keep the buildings cool and to air them out. 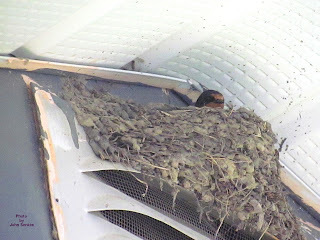 The situation was ideal for Barn Swallows to build nests in. Since most farms had a variety of livestock and pest control was non-existent there were all sorts of flying insects for the swallows to feed on as well. As a result every farm had at least one pair of nesting Barn Swallows and often more. Prior to European settlement of the Americas Barn Swallows built their nests in caves and overhanging rock - anyplace solid that was protected from the rain. As the settlers started to construct buildings, bridges and so on the swallows abandoned the caves and cliffs and moved into the new man-made structures. As a result the swallow population expanded its numbers and range dramatically. For example, the Canadian Prairies which were essentially swallow-free now had swallows everywhere (and still do). Incidentally, the only known site of Barn Swallows nesting regularly in caves today is on the channel islands off the coast of California. During this period in the latter part of the nineteenth century and the early twentieth century the millinery industry relied heavily on wild birds to provide both feathers and the birds themselves to adorn women's hats which were in high fashion then. Egrets were favoured for their feathers but Barn Swallows were actually stuffed and mounted on the hats in various desirable poses. The killing of Barn Swallows got so extreme that groups of concerned people decided to petition the government to put some sort of controls on the indiscriminate killing of all wildlife. The governments of both the USA and Canada responded by passing various acts protecting wildlife - acts that exist to this very day. In addition to government intervention concerned individuals formed societies especially to protect wildlife. One of the most famous of conservation groups to emerge from this period was the Audubon Society. To this day it carries out the work of protecting wildlife particularly species at risk. In the last fifty years or so things seem to have gone in reverse. The small farms with their numerous buildings and livestock have virtually disappeared from the landscape resulting in much larger farms usually specializing in crop production only. Often this necessitates controlling insects with powerful insecticides which are non-selective and kill all insects both good and bad thus leaving birds like swallows with much less to eat. This "double whammy" of the loss of both nesting sites and feedstock has been very difficult for them. The result has been a dramatic decline in the Barn Swallow population in the Americas although they are still common. The province of Ontario has gone so far as to list them as "threatened'. Considering that the worldwide population is still estimated to be about 190 million birds this designation might be just a little premature. There is hope though. Barn Swallows are very adaptable and seem to be moving into towns. Here, buildings abound and many of them do have suitable nesting sites. Although there is very little livestock in towns there is also very little use of insecticides for "bug" control. All this bodes well for the swallows. Barn Swallows are very messy but are lovable enough that most people tolerate them with good humour. At the moment I am aware of three Barn Swallows nests in Foam Lake one of which is on our neighbour's house just under the south peak. I am sure there are more. This week's picture is of a Barn Swallow incubating eggs at our neighbour's place. Barn Swallows are one of the most widely distributed birds in the world found on all continents except Antarctica. They are also one of the most common birds that can usually be seen on one's travels around the world depending on the season of course. In 2007 when we were in Ukraine visiting relatives in one of the villages one of their buildings had a Barn Swallow's nest with young. It was like being home. The only difference was that the Eurasian subspecies is very pale, almost white, breasted whereas the American version is tawny with the male actually being orange breasted. No matter where, they are one of our friendliest and most confiding birds. My hiatus from writing these articles lasted a lot longer than the couple of weeks that I had anticipated. A combination of medical problems will do that to a fellow. To top it all off I have trouble reading my own handwriting at the best of times but after cataract surgery it is a real challenge to say the least (My first copy is hand written). Anyway, here goes. In the last week of June my wife and I took a five day trip through the grasslands in southern Saskatchewan starting in the east at Roche Perce and ending up in the west at the Cypress Hills. Of course visits to the east and west blocs of the Grasslands National Parks were a must. We did not see any lifers but saw many birds that are more or less endemic to that area. I did not have a good picture of a Swainson's Hawk but I got a very good one this time. Hawks are skittish in general but these two Swainson's were completely unconcerned as we stopped the car, backed up a bit, rolled down the window, poked out the camera and took the pictures. This week's picture clearly shows the white chin, belly and breast with the rest being a dark brown. The locals told us that there had been almost a foot of rain this spring and it showed. Everything was a luxuriant green, all depressions were filled with water and cattle grazed in belly high pasture grass. Recently the federal government decided to get out of the community pastures business and turn it all over to the provincial governments. The provincial government of Saskatchewan does not want to manage the pastures and is developing plans to sell/lease the pastures with restrictions as to their use and development. A sizable group of conservationists wants the lands left in public hands. Now we have two opposing points of view with strong support on both sides of the issue so a bit of a dust up is sure to follow. Also, the debate has spilled over beyond Saskatchewan's borders. When we stopped for lunch at a recommended restaurant in Val Marie we happened to bump into Margaret Atwood and her long time partner and renown birder, Graeme Gibson. Both were supporting the group that wants the community pastures left in public hands. It will be interesting to see how it all shakes down in the end. We left Val Marie for a bed and breakfast near Eastend. After a good night's sleep and breakfast we headed for the T-Rex museum perched halfway up the bank of the Frenchman River Valley overlooking the town of Eastend. Save for the front the whole building is built into the side of the bank of the Frenchman River Valley. It is really a cave with a fancy front and well appointed interior that only a federal government could afford to build. There is no fee only a silver collection but the film and guided tour are informative. Of course what would any museum be if it did not sell souvenirs - in this case fuzzy dinosaurs. The last day we spent in the Cypress Hills. The hills are good for rarities like the Bobcat (not Lynx) which is not found anyplace else in Canada. There are about a half dozen birds here that cannot be found anywhere else in Saskatchewan. I have been fortunate enough to have seen three such species- the Dusky Flycatcher, the Macgillivray's Warbler and the Red Naped Sapsucker. All three are common in the Rockies but are found only in the Cypress Hills east of there. Although this article is short on birds I do hope some of you who have never been to the southern part of our province make a point of seeing it. It is a whole different but very interesting world out there. In February I was optimistic about spring being just around the corner. However, Mother Nature has had other ideas giving us more snow and record breaking cold temperatures. Even so there are signs of the coming spring. The large flocks of redpolls have thinned out considerably and the Juncos are back. On April 9, in Saskatoon, I looked out of the window and saw a gopher sunning itself on a sidewalk. 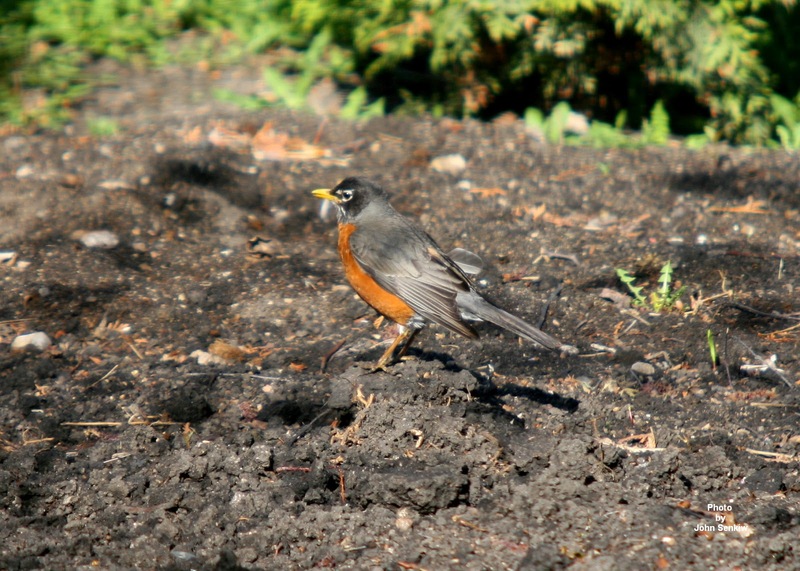 About ten feet away a Robin was on the lawn looking for earthworms and appeared to have found one. All this was occurring with temperatures well below freezing although the day was sunny. Both seemed to have had enough of winter. In my last article the location of the bluebird birdhouses was omitted. The birdhouses are mounted randomly on fence posts on either side of the Yellowhead Highway from Wolverine Siding to the village of Plunkett. There are not as many bird houses as there used to be as the deteriorated ones have not been replaced. It would be a good cause for somebody to undertake. I got an email from Dr. Stuart Houston from the University of Saskatchewan asking Saskatchewan residents to report Turkey Vulture sightings to him if the birds carry wing tags or are nesting. If a tagged bird is spotted note on which wing the tag is located and of course where the bird was seen. If nesting vultures are seen (usually in abandoned buildings) report the location. If it is more convenient contact me and I will forward the information. This week's picture of a Robin weathering a late spring snowstorm was taken several years ago but seemed very appropriate this spring. 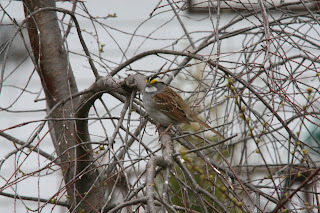 The White Throated Sparrow was photographed during the same storm. As of this writing neither bird is here yet but, I do expect both to be here by the time this goes into print. Finally, I will be taking a hiatus of several weeks for surgery and some recovery time. Hopefully, the spring birds are here by then and perhaps even some surprise visitors.